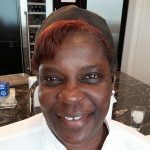 Originally from Atlanta, Cathy Brown’s love of all food and cooking was rewarded when she graduated from the prestigious Le Cordon Bleu Culinary Institute in Orlando, Florida. Chef Cathy is skilled in international cuisine as well a traditional American fare. Chef’s experience ranges from large public arenas to opening small family service restaurant. Cathy worked for in major restaurant corporation’s test kitchen developing new recipes for known national family service properties. She was introduced to Chef Angelo’s Private Dining Service in July 2004 and we have worked together since.